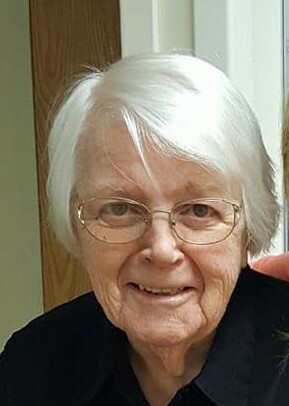 Obituary for Mary Elaine Love | Compassionate Funeral Care Inc.
Elaine Love passed away peacefully on August 28, 2018 in her home in Saratoga Springs, with her friend Felicia Hall-Omar at her side. She was born December 9, 1928, in Melrose, Massachusetts, 3rd of 5 children of Mary (“Mae”) Helene (O’Neil) and William John Condell. Elaine grew up in Melrose, Massachusetts, attended Melrose schools, and graduated from St. Mary’s High School. She attended Massachusetts School of Art and was a skilled, creative artist and teacher all of her life. She taught art at Malden and Dean Junior College, and later at Melrose High School, and for many years gave painting lessons from her home in Melrose. Elaine was also an accomplished fabric artist, knitting and sewing with generosity and enthusiasm for friends and family, often from her own original designs. In 1954 she married William (Bill) Arsnow and had two daughters, Elaine (Lani) and Michelle. Bill died shortly after Michelle was born, and Elaine raised her children in Melrose as a single parent. After her daughters had grown up, she married Donald Love, also a skilled artist, who was a guidance counselor at Melrose High School. Eventually she and Don moved to Saratoga Springs, NY where she very much enjoyed the arts community at Skidmore College. She is survived by her daughter Elaine (Lani) Kennedy of Rhode Island, her sister Nancy Green of Wakefield Massachusetts, 5 grandchildren, special nieces Marin Alsop, Melanie Gillick, and Lori Lewis, and many other nieces and nephews. Her family is eternally grateful to her loving friend and caregiver, Felicia Hall-Omar, for her devotion and compassion. Memorial services will be held at 12 noon on Saturday, September 8, 2018, at Compassionate Care Funeral Home, 402 Maple Avenue (Rte 9 and/or Marion Ave.), Saratoga Springs NY 12866. Family and friends may call from 11am to 12 noon prior to the service. Donations in Elaine’s memory may be sent to Saratoga Clay Arts (saratogaclayarts.org) 167 Hayes Rd, Schuylerville, NY. 12871.